Modern engineering processes and tasks are highly complex, multi- and interdisciplinary, requiring the cooperative effort of different specialists from engineering, mathematics, computer science and even social sciences. Optimization methodologies are fundamental instruments to tackle this complexity, giving the possibility to unite synergistically team members’ inputs and thus decisively contribute to solving new engineering technological challenges. With this context in mind, the main goal of Engineering Optimization 2014 is to unite engineers, applied mathematicians, computer and other applied scientists working on research, development and practical application of optimization methods applied to all engineering disciplines, in a common scientific forum to present, analyze and discuss the latest developments in this area. 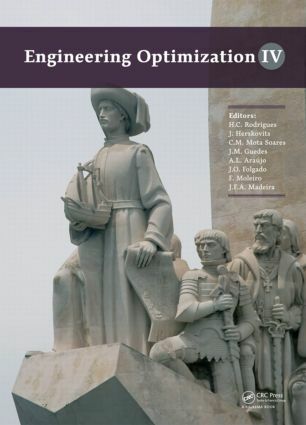 Engineering Optimization 2014 will be of great interest to engineers and academics in engineering, mathematics and computer science. L.S. Santos, A.R. Secchi & E.C. Biscaia Jr.
A.V.L. Machado, D.P. Leitoles, M.K. Lenzi, C.I. Yamamoto & L.F.L. Luz Jr.
F. Lamboia, L.V.R. de Arruda & F. Neves Jr.
J.I. Soletti, S.H.V. Carvalho, C.J. Sousa &A.M. Oliveira Jr.